Snap Circuits Alternative Energy Kit makes learning about electricity and alternate energy fun! With over 125 projects to build, youngsters will have endless hours of fun while learning about circuits, electricity, geothermal power and lots more! This award-winning kit features projects specifically designed to demonstrate how renewable energy is generated. Kids can experiment with solar power, windmills, hydroelectric power, rechargeable batteries, and liquid batteries to experience green energy generation firsthand. The kit comes with 40 parts including green energy components like a solar cell, a hand crank, a fan, a water wheel, and a liquid holder with an electrode. It also includes an instruction manual and educational manual that show step-by-step instructions for all the cool stuff you can do. 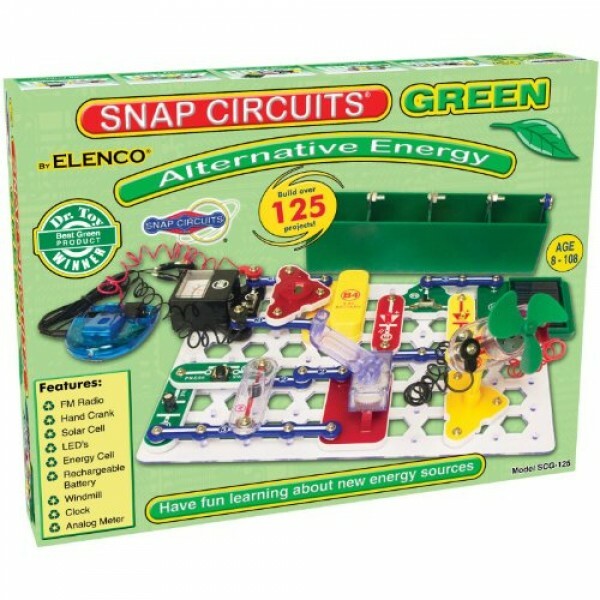 With the Elenco Electronics Snap Circuits Green Alternative Energy Kit, kids can get a hands-on, entertaining education about what green energy means. This innovative kit contains real circuit components that snap together to create working electronic circuits and devices, featuring projects designed specifically to illustrate different sources of electricity. The kit includes over 40 pieces and a manual with 129 different projects. Recommended for children 8 and older, this set will give your child a fun, concrete education on how electronics and green energy work. The Snap Circuits Alternative Energy Kit comes with over 40 pieces to create 129 different electronic projects. The pieces, which include snap wires, slide switches, an electrode, a wind fan, and a rechargeable battery, snap together easily on the included plastic grid--no soldering required. Each piece is numbered and color-coded to make identifying them as easy as possible. These components combine to create working circuit boards just like the ones found inside televisions, radios, and other electronic devices.